Fix your Qi Flow and Give Up the Fags – is it Really that Easy? Acupuncture to Quit Smoking is a controversial topic. There are a number of studies out there that show acupuncture has no effect beyond that of a placebo (a placebo is something that if you think it will work it will, despite having no active effect on you). On the other hand there are a number of studies that show the exact opposite, and that Acupuncture is effective both in the short or long term. My experience with those who use Acupuncture to Quit Smoking is quite positive. The patients I have seen have maintained their status as non-smokers, but as to how long that will last I can’t say. Two of my patients had relapses, one of which was due to business stress leading to a break in treatment and the other due to bereavement. This leads me to an important point about how Acupuncture is used. As much as it pains me to say it, quitting smoking may not be the best thing to do in certain situations. You have to pick and choose your moments, smoking, despite its health risks does aid in relaxation and appetite control. If you are going through a very stressful time, then now is probably not the best time to give up smoking. If the time is right, how can you use Acupuncture to Quit Smoking? I have a full protocol I have used many times to successfully treat smoking addiction and it involves needling specific points in the ears and along the arms. These may also be stimulated with a small electric pulse. This stimulates the production of the body’s natural endorphins, or pleasure chemicals resulting increased nicotine cravings and much easier withdrawal. It’s important to note that Acupuncture isn’t a miracle cure. It can reduce the cravings of cigarettes substantially but not completely. For instance, if you smoked 30 a day, you’d be down to 5. It’s up to the patient to make it through those last few cravings. The good news, these cravings only last about 2 minutes and can be filled with a variety of supporting and empowering techniques that I teach to my patients. There are also a variety of herbs you can use to strengthen the lungs, stomach and throat, and in so doing increase the chances of staying the course. 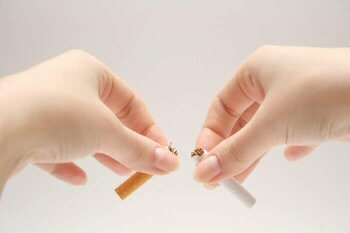 Remember if you can remain a non-smoker for just one day you have increased your chances of staying a non-smoker by over 90%. If you are finding it hard to give up cigarettes but are determined to do so, then perhaps Acupuncture to Quit Smoking could help. If you have any questions or concerns regarding Acupuncture to Quit Smoking or wish to start a course of treatment then please feel free to contact me or make an appointment where we can discus any specific concerns or questions you may have. You have been reading about Acupuncture to Quit Smoking. It may interest you to read about Acupuncture Treatment for Drug Addiction here.